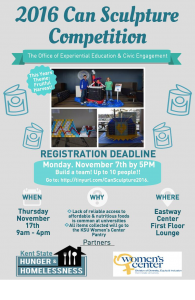 Help Create a KYP sculpture to benefit the KSU Women’s Center Pantry. KYP has registered as a team for this event and will need both non-perishable donations to use as our building materials as well as extra hands to help build the sculpture. If you want to help design and build or make a donation of nonperishable items, contact KentYP@kent.edu. 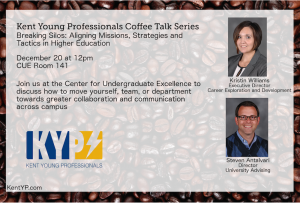 Kent Young Professionals hosting a free Coffee and Conversation series with staff on campus. 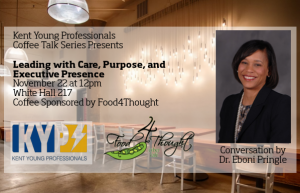 For our first installment, we have University College’s Dean Eboni Pringle stopping by to lead an intimate conversation on Leading with Care, Purpose, and Executive Presence. We will discuss ways to develop our personal leadership style in a way that impacts the college community. Join us on November 22nd at 12 pm in White Hall 217 with free coffee sponsored by Food4Thought Café!